Whether you are christening your first camp oven on an Ozpig in the back yard or catering for a bush wedding, there’s sure to be a recipe in the Camp Oven Recipes collection to entice the culinary senses and broaden the outdoor cooking abilities of people from all walks of life. I have known David for a long time online and he’s always posting a photo of something he just bought to add to his forever collection. You’ve probably guessed it’s mainly camp oven related but sometimes he surprises us and buys something that’s not. This dish is very easy to prepare and cook – just throw all the ingredients in your camp oven and place on your heat source! In this case we are using the Ozpig as our heat source. 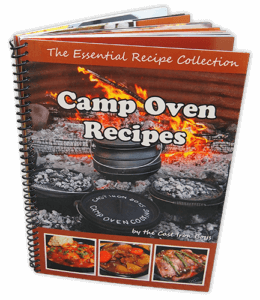 Looking for some yummy camp oven recipes to try out in your camp oven?